Learning Bible verses can be a breeze when we memorize it with a song. The Rizers have an easy tune to help us remember Psalm 100: 1-2. As always I like to provide a printable of the verse as well. You can print the image below from the resource library and hang it up throughout the week to keep the song of Psalm 100: 1-2 in your head. The more often you and your children repeat the song and see the words, the better the chance it has to stick in your head for the years to come. Check out the whole ABC Memory Series! If you have been following this series then this will be your 13th verse. That means we are halfway through! If you are just beginning then feel free to jump right in on verse “M.” Or start here with the letter A and learn a new one each week. We work through the alphabet because it’s fun for kids, but these verses are great for anyone. And everyone, child or adult, learns best through song. 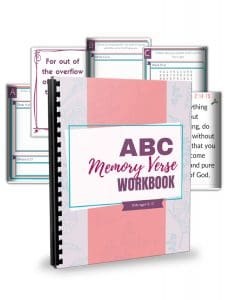 Get the ABC Memory Verse Workbook to go along with the series HERE. Looking for Encouragement as a Mom? –>Check out 20 inspirational Christain songs. Skip to the bottom of the post and just listen to all 20 songs on loop from the YouTube channel! –>Join a 6-week prayer challenge. Complete with weekly prayer journal, specific Bible verses for encouragement and a new screensaver each week for your phone and worship videos emailed to you mid-week. –>Up your prayer life with these tips on how to pray effectively.